I mentioned some of the business thinkers we often draw on, like Jim Collins and Peter Block. My new friend nodded politely, but I was clearly speaking to a Drucker man. He told me how Drucker’s business frameworks had guided his successful career as a manager. How they were now helping him transform the effectiveness of the nonprofit board he served on. These are all questions we ask and answer in the course of strategic planning with our clients, although not in Drucker’s specific terms. For instance, the word “customer” was once a refreshing shock to nonprofit sensibilities, a challenge to those who automatically disdained commerce and marketing. Later on, calling donors and clients “customers” became a cliché. When a useful term becomes a buzzword, it shuts down the good thinking it once may have stimulated. 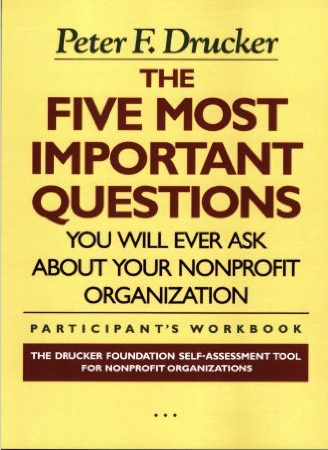 But it’s been a while since Drucker’s heyday and “customer” seems to have dropped out of frequent use in the nonprofit world. So, maybe it’s time to bring the “customer” back into our strategic discussions. In any case, I’m glad to be challenged to learn more about the amazing Peter Drucker and I’m looking forward to learning more about his Five Questions.